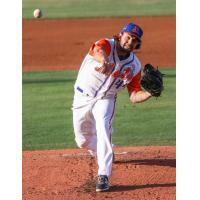 DAYTONA BEACH, Fla. (May 11, 2015) - The Florida State League announced on Monday that St. Lucie Mets right-hander Robert Gsellman has been named the FSL Pitcher of the Week. Gsellman made one start last week and it was a dandy. On Monday he shut out the Palm Beach Cardinals over eight innings in a 4-0 win. He took a no-hitter into the eighth inning and it was finally broken up on a chopper up the middle with one out. Gsellman promptly got a double play ball from the next batter on his 94th pitch to end the inning and his night. Gsellman walked three, struck out six and was helped out by three total double plays. The shutout performance dropped his ERA to 1.55 (five earned runs in 29 innings). The Mets are 5-0 in Gsellman's five starts. He is 4-0. The one start he did not win came in a 7-1 victory over Jupiter on April 27. He pitched 4.2 innings and fell one out shy of qualifying for the decision. Gsellman, from Santa Monica, Calif., is in his fifth season with the Mets. The 21-year-old was drafted by New York in the 13th round of the 2011 draft out of Westchester High School in California. This is Gsellman's first full season with St. Lucie. He made two brief appearances in 2013 in Advanced A and went 1-0 with a 3.00 ERA. Gsellman will start tonight's game vs. the Tampa Yankees at 6:30 p.m.
Gsellman is the second Met to win a Florida State League Player or Pitcher of the Week award this season. Outfielder Michael Conforto was the FSL's first Player of the Week this season (April 9-19).